The Business Edition: 2014 National Survey on Mobile Technology asked Technology Directors, CIOs, and CTOs to identify the top platforms for mobile technology, in order to help developers and businesses prioritize their latest software development. 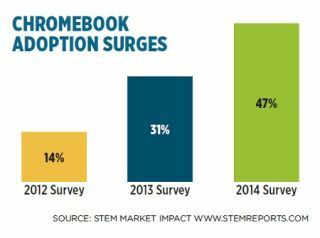 For the third year in a row, Chromebook adoption in K-12 schools is on the rise. Educators were asked to choose from the following: ebook readers, iPod Touch, iPad, Android tablets, Amazon Kindle Fire, B&N Nook, Google Nexus, LearnPad, Samsung Galaxy Tab, smartphones, and other devices.